IN THE ST. LOUIS "METRO" AREA. I guarantee if you’ve played, coached, officiated or watched high school football in the St. Louis area you’ll have a connection to these books. In these pages you’ll reunite with old friends and rivals while discovering other legendary players, coaches and teams. These books are in a sense our "Metro" yearbook and Hall of Fame, where the fierce competitors of the past are remembered forever. These books give us an opportunity to look back as our game moves forward. ENJOY! These books honor the accomplishments of those who have played and coached the prep game while recognizing the contributions of officials, the media and administrators who have sustained it. They are in a sense our “Metro” yearbook and our Hall of Fame, where the fierce competitors of the past are remembered forever. This is your story! A football legacy established in 1888. This game exists because of your participation and contributions. 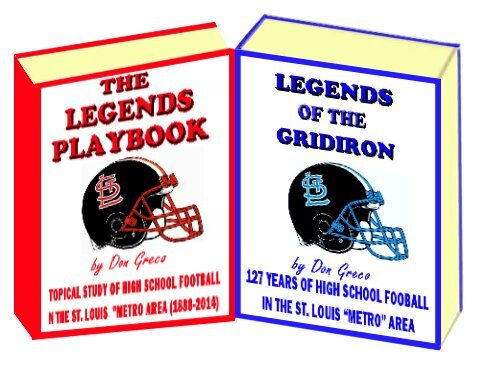 The “Legends Series” is a collection of 3 books that offer the reader an interesting and unique perspective of high school football in the St. Louis “Metro” area. More than 10 years of research, more than 800 pages and 200 pictures detailing 127 years of high school football in the St. Louis "Metro" area. “Legends of the Gridiron”, this book is a chronological and pictorial history of the first 127 years of high school football in the St. Louis “Metro” area, photographs and stories detailing hundreds of teams, players, coaches, officials and contributors from each decade. Over 10 years of research by the author has produced a book like no other, more than 500 pages bringing to life the greatest story never told! And now an e-book....... Oh how things have changed since the release of the first (June ’08), edition of the “Legends Series” books. In 2009 we saw three area teams capture state titles. Vianney quarterback Dalton Hewitt ended his career with more passing yards than any player in the history of “Metro” football (7,734 yards). East St. Louis quarterback Detchauz Wray tossed an all time “Metro” record 81 touchdown passes while accumulating more passing yards than any quarterback in the history of “Metro” east football (6,643 yards). Courtney Molton finished his career as the all time leading rusher at East St. Louis High School (5,250 yards) surpassing the mark set by Chris Moore (5,174 yards) in 1991. In 2009 we were witness to one of the greatest finishes in the history of St. Louis “Metro” football: “The Miracle at Moss”. In 2010, five area teams advanced to the “Show Me Bowl” yet failed to bring home a title. Rob Standard of Chaminade College Prep broke the “Metro” career rushing record for the third time in the last four years. Standard accumulated an incredible 7,799 yards and an all time “Metro” record 98 touchdowns. After a twelve year hiatus, legendary coach Mike Russell began his second stint at Lutheran North High School. East St. Louis was placed on probation and nine more teams are playing on synthetic turf. The offenses continued to dominate the gridiron in 2011. A pair of quarterbacks passed for over 3,000 yards and sixteen others threw for more than 2,000 yards. Four area teams advanced to the “Show-Me-Bowl” with a combined 52-1 record yet all lost close games and failed to win a state title. An additional eight “Metro” schools installed synthetic turf in 2011 bringing the total to 37. On the college scene running back Montee Ball (Timberland High School ’09 /Wisconsin) tied Barry Sanders single-season touchdown record (39) and finished fourth in the Heisman Trophy voting. Ball is one of only two Heisman finalists from the St. Louis “Metro” area. In his senior season ('12), Montee Ball set the NCAA Division I record for most career touchdowns with 83. In 2012, a new Missouri play-off system “gifted” every team into the post season. Kirkwood captured its first state championship and John Burroughs lost their third consecutive title game. Belleville Althoff made its first appearance in the Illinois championship game since winning back-to-back titles in ’89 &’90 and Francis Howell was the first St. Charles County team to play in a "Show-Me-Bowl" in 30 years. We saw the realignment of the Gateway Athletic Conference, the AAA League and the 84-year old ABC League, now called the Metro League. CBC was the first team in the “Metro” area to install synthetic turf in 2003 and the first to replace it in 2012. Mike Russell steps down at the end of the 2012 season, after two coaching stints, 24 years, 185 victories and 4 state championships at Lutheran North, In 2013, eleven “Metro” teams finished the regular season unbeaten and 9 advanced to the semifinal round of the play-offs. Parkway Central and Staunton were the only teams to play in the title game. Markel Smith of Vianney set the Missouri single game rushing record with 541 yards and finished his career as the second all time leading rusher in the Metro: area with 7,145 yards. The 2013 Season was the last for the Suburban North, South, West and East Football Conferences. The historic leagues were broken up and its teams reassigned for the 2014 season. Longtime coach Jim Schottmueller stepped down after 29 seasons at McCluer North and 8 more schools installed turf. Welcome to the 5th edition of the “Legends Series”, a 127 Year History of High School Football in the St. Louis “Metro” area. Since the release of the first edition in June of 2008, I’ve had the pleasure of talking too many of you about our great football heritage. Your response to the books confirmed what I already knew. St. Louisians love high school football and cherish their gridiron experiences. I’ve been humbled by the positive response to the books and I appreciate your interest, your feedback and your help. I believe that you’ll find the 5th edition even more interesting than the others. I’ve listened to your suggestions and have done my best to incorporate them. The books are updated through the 2013 season and include more stories and pictures from each era. I’ve continued my extensive research and have expanded the story line on the journey of the African American player in the St. Louis “Metro” area. Now sit back in your favorite chair with your favorite beverage and enjoy your story, the Never Ending Story of St. Louis High School Football! Football is the connecting line that links the past, the present and the future into one everlasting bond that stands the test of time ………… Football is truly the Greatest Fraternity! St. Louis has a rich and well documented sports history with its professional and college teams but the greatest sports story never told in our area is the tale of high school football. "St. Louis High School Football - Past & Present"